GPU Card. It seems HIS with R9-280X time series is very serious in arming its graphics card. With factory overlock 50MHz when turbo boost over AMD's reference, make clear that the graphics card is intended for gamers who want more performance but not willing to buy the series R9-290X with reason price. 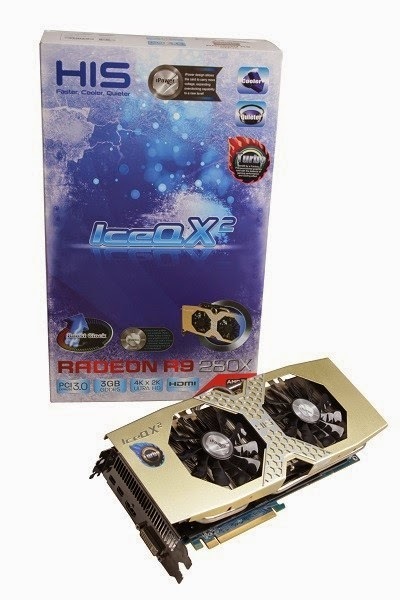 Compared with R9-290 series, which cost about 100 dollars more expensive than the graphics card, the more clear that the series can be a rational choice R9-280X gamers than the series on it. As already known in advance that the graphics card is actually a rebranded from HD7970 series that uses the GPU codenamed Tahiti. Armed with two 8-pin power for overclocking stability. In the overclocking tests with the method of raising the GPU core clock of 100MHz and 100Mhz memory as well and then benchmark tests. In the gaming benchmarks Metro Last Light there is an increase of performance becomes 45fps to 50fps. While in testing Fire Strike 3D Mark 2013 score of 7977 obtained from the previous 7524 points. So it can be concluded there is a significant improvement than the default clock. A very interesting is the maximum temperature recorded. When standard, the maximum temperature is 66 degrees Celsius, while at the overclock is 68 degrees Celsius. So it can be concluded that the IceQ cooler X2 works very efficiently withstand temperatures when the maximum load. If we look at the price offered by HIS with R9-280X series, with prices still under R9-290 type but when in standard conditions and turns overclock graphics card is capable of approaching even beyond the scores obtained R9-290, the graphics card is very so worthy choice for gamers. Moreover, gamers who are planning to use these graphics cards in CrossFire mode. However, the sales package is fairly mediocre and there are no games bundled in it.